Unlike larger versions, mini trampolines aren’t designed for backyard fun. Instead, mini trampolines are fitness tools that can help users enjoy exercising. Mini trampolines are ideal for those looking for a fun way to complete low-impact aerobic exercise. Not only will this bouncy tool help you get in your aerobics, but it also increases flexibility and balance. Even better, you can complete a mini trampoline workout indoors or outdoors. Because mini trampolines and toy trampolines for kids look similar, it’s important to understand what to look for in an aerobic trampoline, so you can get exactly what you need. What’s the best trampoline mat material? Do mini trampolines pose the same injury risks as full-size trampolines? 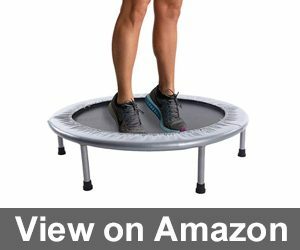 Can individuals with bad knees or arthritis use a mini trampoline? What benefits are provided by a mini trampoline when compared to a full-size trampoline? How long should a mini trampoline workout be? What are the benefits of rebounding exercise? The Pure Fun 40-inch exercise trampoline is created with an attached handrail. The handrail offers support to exercisers by providing a handle to hang on to. The platform of the trampoline is 40-inches, which allows it to decrease the chances of falls or injuries that are sometimes attributed to smaller platformed trampolines. The adjustable handle makes this choice ideal for beginners or those with balance issues. 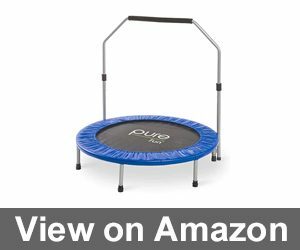 The simplicity of the Pure Fun 40-inch mini trampoline makes it a great choice for novice rebounders who haven’t fully committed to incorporating this tool into their daily or weekly routines. The 40-inch platform is a great way to keep jumpers safe while they are learning to use it properly and the mat provides a stiff jump. More serious rebounders may be disappointed with the quality of the trampoline. 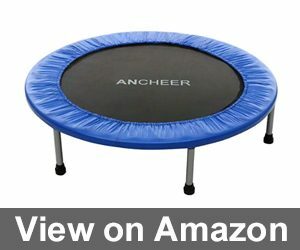 The ANCHEER rebounder trampoline features a 220lb weight limit and features rubber designs on the legs. It is unique as compared to other mini trampolines because it has the ability to be folded, which means it can be stored easily. The mat is very stiff, which is common with affordable mini trampolines, but it’s important to realize a stiff mat can cause leg, foot, or ankle pain with overuse to those that are prone to pain in those areas. 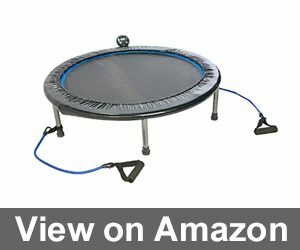 If you’re looking for a mini trampoline to try before investing in one for serious rebounders this is a great option. Keep in mind that the spring cover has a reputation of falling apart with ordinary use, which means you are likely to end up with a trampoline that has exposed springs. The mini trampoline is still usable in this condition, but it could cause some injury risks. Most reviews regarding the assembly of this equipment recommend skipping the paper instructions that come with the product and watching the company created assembly video instead. After watching the video, it should only take fifteen minutes to assemble it completely. At first glance, the Stamina InTone oval jogger is different from other mini trampolines in the same market. The visual difference is the oval shape of this Stamina model. Most mini trampolines are circle-shaped. Stamina promotes the oval surface as being better for stability. Another difference between this product and others is the inclusion of a multi-function fitness monitor. The monitor automatically tracks jumps and workout time including the approximate number of calories burned. The trampoline also includes upper body cords for a whole body workout. The Stamina oval jogger offers a bouncy mat, adjustable handle, and unique design. The oval center prevents users from jumping all over the place, but the flaw of this product is the bands. Instead of using traditional steel springs to hold the mat to the frame, the mat is connected to the frame using bands. 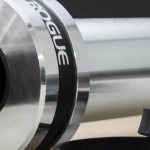 After extended use, the bands have a tendency to wear out. The mini trampoline is a great choice for those beginners who want to concentrate on their whole body at the same time but might disappoint serious rebounders who expect more. The 38-inch PLENY mini fitness trampoline is a great option for novice trampoline joggers. The hard surface of this equipment makes it a better option for jogging rather than rebounding, but both activities can be completed safely. The addition of the ergonomic safety handle makes it easy to use for those of all ages including kids, adults, and senior citizens. 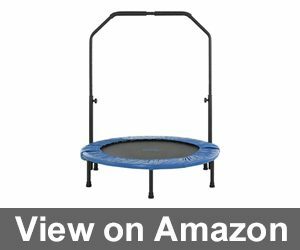 Reviewers have stated this mini trampoline is best for novice rebounders and those more interested in jogging on the trampoline rather than just jumping. The addition of a sturdy, durable frame allows users to be confident in the product. It also has a 300 lb weight capacity, which is considerably more than some others in the market. Reviews show that even after extended use by individuals in this weight range, the mat and frame stayed completely intact. If you just want to get some lymph flow, the Marcy Trampoline cardio trainer with a handle is the ideal solution. The compact, round trampoline provides a solid mat. The mini trampoline is designed with bands instead of steel springs, so it’s not recommended for big jumps or advanced moves. It’s important to read the instruction manual before trying to assemble. The mat comes folded and can be difficult to unfold if instructions aren’t followed correctly. Many casual jumpers want a trampoline that provides a low-impact workout. Marcy has achieved that with this mini trampoline. It’s easy to use and store, which means there’s no reason not to use it. 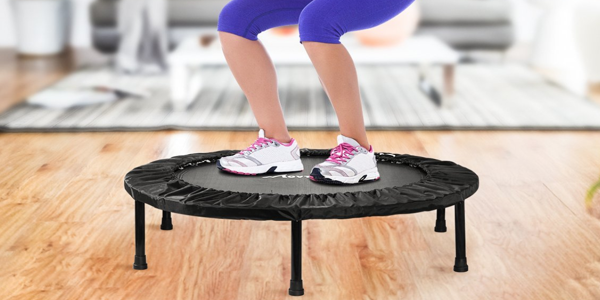 The Stamina 38-inch Intone Plus Rebounder is ideal for low-impact cardiovascular exercise. It’s a great activity for all fitness enthusiasts. 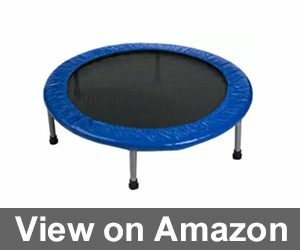 The large mini trampoline features a durable rebounding surface. On its edges there are two resistance tubes with handles that are ideal for upper body strengthening. A multi-functional electronic fitness monitor is built into the equipment and tracks jumps per minute, total workout time, and total jumps. 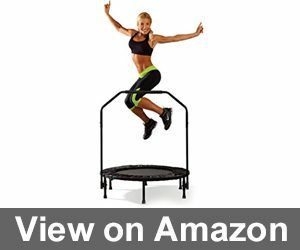 If you’re new to rebounding and want to try a mini trampoline workout before investing lots of money, this Stamina product is a good choice. For aggressive rebounders, the fabric straps may not be ideal for a long-time use but give rebounders and fitness enthusiasts a good idea of what to expect. Stamina is known for creating quality mini trampolines. The 36-inch folding trampoline is great for casual rebounders. The trampoline provides low-impact cardiovascular exercises. Not only does this foldable trampoline store easily, but it also comes with access to three online workouts. The workouts feature an introduction, intermediate, and expert level workout. The all-steel frame is outfitted with rubber tips that protect wooden floors and the rubber bands used for tension make it a very quiet piece of equipment. The 36-inch Stamina is a good mini trampoline if you have the right expectations. First, it’s not designed for super aggressive rebounders. 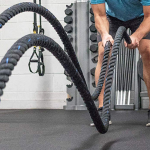 No trampoline with fabric bands instead of steel springs is designed for aggressive workouts. Second, it’s important to realize that folding and storing the trampoline is a difficult task. In some cases it could take two adults to complete this task. With that level of difficulty, it’s probably not something that you would want to do every single day. 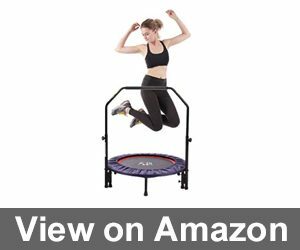 The Airzone mini band fitness trampoline has a simple design and is easy to use. Like a few other models mentioned, the Airzone model uses fabric bands instead of steel springs. The jump mat is made of woven polypropylene material, which is the same material used on full-size models. The Airzone mini trampoline is a great option for many jumpers. It isn’t designed to be a toy, which means it doesn’t allow for a very spring or high jump. The metal frame provides durability and stability that helps provide a low-impact cardiovascular experience. 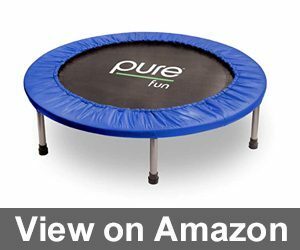 The Pure Fun mini rebounder trampoline is 38-inches round and provides a sturdy surface for rebounders. The mini trampoline uses 32 galvanized steel springs. Each spring is 2.75-inches long. The tough springs provide a superior bouncing experience. The jump mat itself is also very durable. It’s created with polypropylene material and the exterior of the trampoline pad is padded. 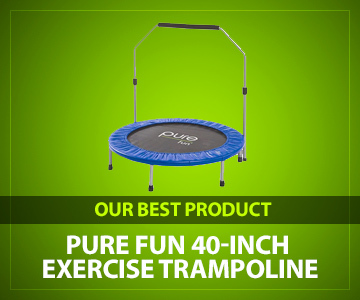 The Pure Fun mini trampoline is an affordable way to exercise. Jumping on this mini trampoline allows for a low-impact cardiovascular event. The trampoline doesn’t fold, so it will have to be stored fully intact, but it is extremely durable. The springy mat and galvanized steel springs allow for great jumps. It’s important to stick to the manufacturer weight limit restrictions and to assemble the trampoline properly to ensure the safety of all users. 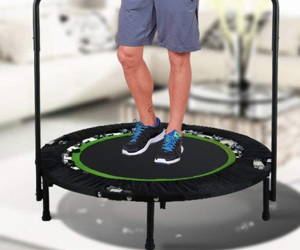 The Upper Bounce mini trampoline provides an excellent opportunity for aerobic workouts. The 40-inch trampoline is foam padded and features an adjustable, sturdy handrail. The addition of this handrail improves stability needed for rebounding workouts. The trampoline uses steel springs for a better bounce. The frame has six legs for incredible sturdiness and can be assembled in just a few minutes. The Upper Bounce mini trampoline is affordable and created with rebounders in mind. The sturdy design of this model allows it to be used indoors or outdoors. It’s difficult to fold and store it away, so it’s a good idea to find a designated place to leave the equipment or lean against a wall. If you’re an avid rebounder looking for a great option to jump at home, this is a great choice. When shopping for a mini trampoline for cardiovascular exercise, it’s important to understand the differences between the two main designs: steel springs and fabric bands. Trampolines that use springs tie the mat to the trampoline. With a steel spring trampoline, rebounders can expect a great workout with the ability to jog easily. Trampolines that use fabric bands connect the mat to the frame the same way a steel spring does. However, the tension can change with use as the fabric stretches. If jumped on aggressively, the mat can also begin to sink a bit in the middle. Fabric bands are also more likely to snap than a steel spring, which can affect the overall effectiveness of the equipment. 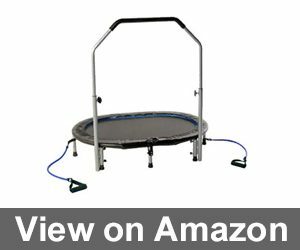 Choosing between a steel spring mini trampoline and a fabric band mini trampoline is a rebounder’s personal choice. But understanding the differences allows users to pick the option that is best for their budget and exercise goals. Exercise trampolines are designed differently than backyard trampolines created just for fun. All in all, the best mat material for trampolines is those made of polypropylene. Polypropylene is the safest material on the market for this type of equipment because it is a buoyant webbed fabric. It is thermally interlocked and provides a smooth, stabilized surface to jump on. The material is also capable of being stressed and flexed without losing its buoyancy. No, mini trampolines don’t pose the same injury risks as full-size trampolines including head injuries. First, a full-size trampoline is elevated several inches, sometimes feet, off the ground. A mini trampoline is only a few inches off the ground. There also isn’t much room to do awkward or difficult tricks on a mini trampoline, so users won’t have the space to get hurt. Individuals with bad knees, ankles, or arthritis may think a mini trampoline isn’t for them, but that’s not true. In fact, a mini trampoline is designed for a low-impact exercise activity. If you suffer from arthritis in your knees, a low-impact exercise may be exactly what you need. Not only does a mini trampoline offer the opportunity to provide this type of equipment, but it also helps to improve balance and strengthen leg muscles, which can help take stress off knees. If you have a backyard trampoline, you may wonder if you truly need a mini trampoline. In theory, one would think you could perform the same exercises on a mini or full-size trampoline and expect the same results. Although this may be true to some extent, there are certain topics that should be considered before you begin a jumping routine. First, you need to consider the size of a mini and full-size trampoline’s springs. A mini trampoline uses short, tight springs. With small springs, a jumper is pulled downward when jumping. A downward pull creates more resistance than could be experienced with a full-size model and results in a more strenuous workout. On average, a mini trampoline workout should last about 10 to 15 minutes long. When compared to traditional jogging, a 10-minute trampoline jog is equal to a 20 to 30 minute jog on a road. Many novice and intermediate rebounders begin jumping on a mini trampoline to improve their fitness. In addition to providing a low-cardio impact activity, jumping on a mini trampoline can also improve a person’s lymphatic system, strengthen muscles, and improve balance. When a person can activate the flow of lymph in their lymphatic system, they will strengthen cells and improve efficiency of other activities such as diet. As you can see there are many things to consider when buying a mini trampoline. To make the right choice, it’s important to consider how often you will use the trampoline and whether you are new to cardiovascular exercise or an established athlete. It’s important to make this distinction because it will significantly impact what you would expect from this type of equipment. Next, you need to determine if you will be jogging or rebounding. Joggers will want a stiffer mat. Those that want to rebound more than jog will want a softer mat. One of the main differences between many of the trampolines mentioned above is whether they use tension springs or fabric bands. Each has pros and cons, and ultimately it’s up to the user to decide which one is best for their exercise situation. I like Stamina InTone Oval Jogger for its adjustable handlebar and electronic fitness monitor. It seems like this mini trampoline is the best option on the market. You won’t understand this until you try dozens of bad options as I did. Jason Johnson here, I created SportsTopics to give people a better product insight before they make that all important purchase.